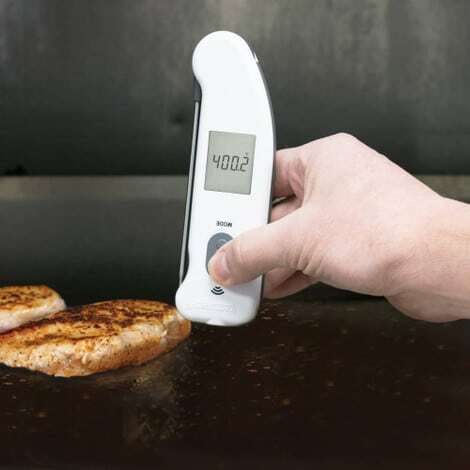 The product market for the cooking and grilling industry is absolutely inundated with tools and utensils that cooks don’t need, don’t want, and can’t really use—and then there’s the Thermapen IR, ThermoWorks’ infrared thermometer with a thermocouple probe. ThermoWorks, creators of the highly lauded and bestselling Thermapen classic and the MK4 instant read thermometers have just dropped their latest innovation called the Thermapen IR. The Thermapen IR combines everything we’ve come to trust and love about the classic Thermapen while adding on an Infrared Thermometer. It’s like having two professional tools in one making this a very versatile instrument without sacrificing the unequaled speed and accuracy we have come to expect from ThermoWorks products. Being a fan of any tool that cuts down on the clutter in the kitchen or BBQ area, I’m impressed by the way ThermoWorks basically doubled up with this thermometer. It promises to come through with the accuracy and speed found in the brand’s Thermapen Mk4, which is a favorite among grilling masters and pit bosses, as well as home chefs who work on the stove. However, you also get the versatility you expect from a pro-quality infrared thermometer. Normally, using an infrared thermometer means first paying extra—and out the nose—since infrared is still largely considered a pleasure of professional chefs. It also means using two thermometers for the same piece of meat, which is a hassle that can also affect the flavor and succulence of your meat. Forget that. It’s more convenient to have two temperature gauges in one. By the time you reach the end of this review, I’m positive you’ll agree that this Thermapen is a cut above the rest. The Thermapen has double the benefits because it’s double the thermometer. That you can get both an infrared reading and a thermocouple reading allows you to cut down on the collection of thermometers you’ve probably amassed. You don’t have to switch from one to the other, you don’t have to take up space with two tools, and you can measure a variety of foods and cooking areas and their temperatures with just the one unit. Beautiful, right? Although you often see infrared thermometers used in electrical and HVAC work, the technology has long been found in the kitchen as well. Where it was once the secret weapon of professional chefs, grillers, and pit masters, the accuracy of infrared is finally finding its way into home kitchens and backyard patios. Infrared is excellent at pinpointing hot spots, which saves you from an uneven cook. However, you can check more than meat and cooking surfaces, and you can even use an infrared thermometer to make sure that you’re storing your food at the proper temperatures. The most impressive part is that you can check a chicken breast, then hover the thermometer over, say, a double broiler full of chocolate without the risk of cross-contamination. The value in the Thermapen IR is that you also get the advantages of a thermocouple thermometer. As a result, you can gauge higher temperatures since the metal probe has an extremely high melting point. Not only do they provide quick readouts, but they’re also sensitive to any changes in the temperature of your food. You can thank the conductivity of the metal for that. No matter how small the change in degrees, the Thermapen probe will catch it. That allows you to get ahead of any heat flares or undercooked areas. You’re essentially using two thermometers with the Thermapen. You may not be familiar with infrared temperature readings or how to use one. Some folks touch the infrared portion of the unit directly to the food, which defeats part of the purpose. There’s no need for contact between the surface of the thermometer and your food or cooking surface. Hovering over the surface is enough for a readout. 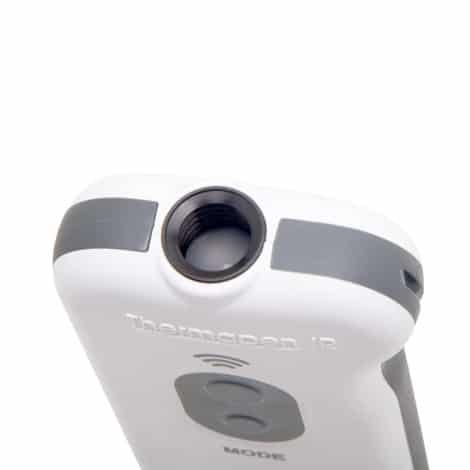 Then, just hit “Scan.” The Thermapen IR promises an accuracy of ±1.8°F for its infrared thermometer. The thermocouple probe is just as easy to use. It’s as simple as pulling out the probe and inserting it into your protein, liquid, or any other piece of food you need to check. Just change the mode on the front of the thermometer. The buttons are easy to read, you can seamlessly switch between Celsius and Fahrenheit, and the display is clear from any direction. The probe is accurate to within ±0.7°F which is as good as you will find anywhere. The quality of a ThermoWorks product, not to mention the versatility of the Thermapen IR is the primary reason it’s a popular pick for grill masters, pit masters, and home chefs. Ease of use in the kitchen—or on the grill—is essential. 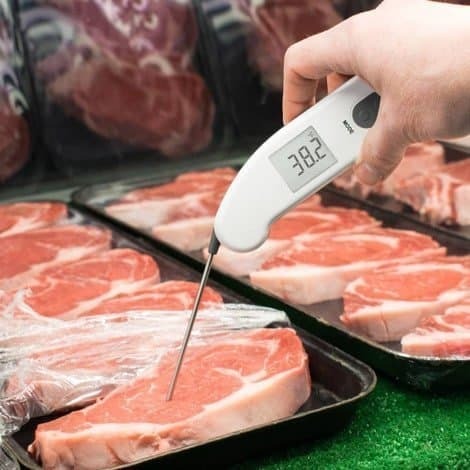 When you work with high, hot temperatures, the few seconds it takes to put down one thermometer and pick up another is just enough to ruin the perfect medium rare or cause a heat related injury. 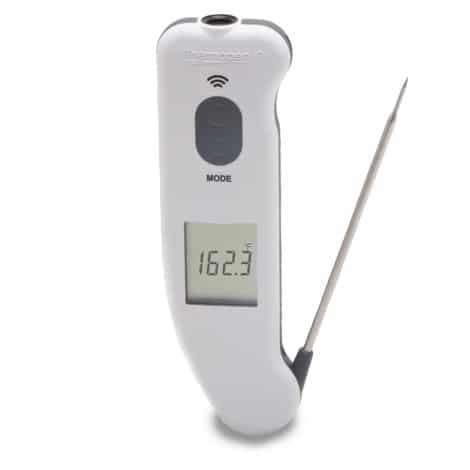 There’s an implied guarantee of the perfect cook with this thermometer, though. It doesn’t just make a claim, either; it actually follows through. This particular model has many features that are just plain handy, too. From less than a degree to just a tick over—I’m cool with those odds for exact accuracy. I don’t know about you, but I’ve been grilling long enough that I can confidently eyeball most meats. But for the best results, an accurate thermometer is still vital, and the margin for error here is so small that I’ll take it. Just remember that when you need a readout that gets as close to perfect as possible, two is always better than one. Between the infrared gauge and the thermocouple reading, you have a clear picture. The two thermometers work better together for a variety of reasons. They’re each adept at catching differences in temperature. You might not realize how often that can mess up your meat, even on the stove top. Almost everyone has that one burner that kind of ignores half the cooking surface, right? However, tracking hot and cold spots is particularly important on the grill. It’s doubly crucial if you work with charcoal, but even gas grills can throw off flares. When every second counts, quick reads are critical. The Thermapen’s probe tosses out the temperature in 2-3 seconds. The infrared reading is almost instantaneous. You won’t waste precious time—or juices—waiting for the temp to pop up on the display. The rotating probe makes it simple to get at any strange angle you need. The IR’s display automatically rotates to read right side up, as well, so if you have to twist your wrist to snag a temp, you can still read the display. ThermoWorks apparently has the patent on that technology, which is pretty cool. The Thermapen IR has a sleep mode to save on battery life. What’s really clever is that it has a motion sensor that turns it off and on when it detects movement from you—or the fire, for that matter. The unit also shuts down as soon as you close the thermocouple probe. The IR lets you easily adjust the emissivity on the go so you don’t have to worry dark or lighter surfaces causing inaccurate readings. Infrared mode gives you the option of choosing between Max/Min functionality, which displays either the maximum or minimum temperature recorded during a given measurement according to your preference. Who Is the ThermoWorks Thermapen IR For? The Thermapen IR is for professional cooks, obviously, but it’s for everyone else, as well. Use it if you frequently grill, whether outside or on an indoor grill. You won’t need it as often with smoked meats, but it does come in handy. Cooking on the stove and in the oven benefits from the thermometer, as well. You’ll never have a juicier, more succulent turkey on Thanksgiving. If you’re honestly not sure if you’ll use it, if you’re on a budget, or if you’ve never used an infrared tool before, you might be a bit intimidated by the Thermapen. For budgetary concerns, you can always save up or request it as a present for a birthday or holiday. Otherwise, maybe start with an original Classic Thermapen or the newer MK4 Thermapen first. The Thermapen IR comes in at $129 which. The warranty lasts for 2 years from the date of purchase and guarantees against defects in either components or workmanship. Thermoworks will either replace or repair the product for you in that period without charge. The probes are only covered for six months, unfortunately, but ThermoWorks has a great reputation for quality. Fortunately, the Thermapen IR is extremely durable and largely reliable. For what it does, it’s worth the money if you have the need, but I’d be lying if I didn’t admit that you can find dual thermometers that do the same for less. They just won’t include the same guaranteed craftsmanship, performance, and reliability of a ThermoWorks product. If you need quick and reliable readouts for both surface temperatures and for internal temperatures and you don’t want to have to use multiple instruments, then you are not going to find better. It’s a pricey investment, sure. But considering what the average cook pays for meat, especially cuts like roasts or tenderloins, the Thermapen IR is a very good investment. And the IR should last for years with just a little care. I hope this ThermoWorks Thermapen IR Review was helpful for you. 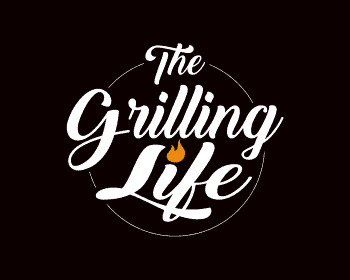 As always, if you or someone you know is interested in grilling and cooking thermometers please consider sharing with your friends or on social media. Sharing is caring my friends! If you would like to leave a comment or have a review of your own to share on the Thermapen IR, please do so below. We always welcome your input and I would love to hear about your experiences with the IR.